Some interesting consequences about the nature of the soul here, which we flesh out later (get it?). Also, more proof that Equality is not part of the system. 1 IT remains now for us to show that the distinction among things did not result from different movements of the free-will of rational creatures, as Origen maintained in his Peri Archon. For he wished to refute the objections and errors of the early heretics, who strove to prove that the different nature of good and evil in things is owing to contrary agents. But on account of the great difference which he observed both in natural and in human things, which difference apparently is not preceded by any merits,–for instance that some bodies are lightsome, some dark, that some are born of pagans, some of Christians,–he was compelled to assert that all differences to be found in things have proceeded from a difference of merits, in accordance with the justice of God. For he says that God, of His mere goodness, first made all creatures equal, all of them being spiritual and rational: and these by their free-will were moved in divers ways, some adhering to God more, and some less, some withdrawing from God more, and some less; and in this way there resulted through divine justice, various grades in spiritual substances, so that some were angels in their various orders, some human souls in their various states, some demons in their various states: and on account of the diversity among rational creatures, he said that God had established diversity among corporeal creatures, so that the more noble spiritual substances were united to the more noble bodies, and thus the corporeal creature would minister in all other various ways to the diversity of spiritual substances. Notes Link to Peri Archon. Also take delight in the word lightsome. 2 But this opinion is clearly convicted of falsehood. For among effects, the better a thing is, the more does it obtain precedence in the intention of the agent. Now the greatest good in things created is the perfection of the universe, consisting in the order of distinct things: because in all things the perfection of the whole takes precedence of the perfection of each part. Wherefore the diversity of things results from the principal intention of the first agent, and not from a diversity of merits. 3 Again. If all rational creatures were created equal from the beginning, we must say that one of them does not depend on another in its action. Now that which results from the concurrence of various causes, one of which does not depend on another, is casual. Therefore according to the aforesaid opinion, this distinction and order of things is casual: and this is impossible, as proved above. Notes Equality is not natural—nor desirable. 4 Moreover. That which is natural to a person, is not acquired by him by his will: for the movement of the will, or free-will, presupposes the existence of the willer, and for this his nature is required. Accordingly, if the various grades of rational creatures were derived from a movement of the free-will, all rational creatures would have their respective grade not naturally but accidentally. But this is impossible. For since the specific difference is natural to each thing, it would follow that all created rational substances are of one species, namely angels, demons, human souls, and the souls of the heavenly bodies (which Origen supposed to be animated). That this is false is proved by the diversity of natural actions: because the mode by which the human intellect naturally understands is not the same as that which sense and imagination, or the angelic intellect and the soul of the sun demand: unless perhaps we picture the angels and heavenly bodies with flesh and bones and like parts, so that they may have organs of sense, which is absurd. It follows, therefore, that the diversity of intellectual substances is not the result of a diversity of merits which are according to movements of the free-will. Notes Neuroscientists and philosophers against free will take note! Free-will presupposes the existence of the willer. Deny free will, deny the existence of the willer—and of the nature or essence of the willer. Take particular notice of what Aquinas says of angels. 5 Again. If things that are natural are not acquired by a movement of the free-will; whereas the union of a rational soul with such a body is acquired by the soul on account of preceding merit or demerit according to the movement of the free-will; it would follow that the union of this soul with this body is not natural. Therefore neither is the composite natural. Yet man and the sun and the stars, according to Origen, are composed of rational substances and such and such bodies. Therefore all these things which are the noblest of corporeal substances, are unnatural. Notes Part of this argument shows that we are soul-body, not soul + body. We can’t have acquired a soul accidentally by merit of our will. It has to be there on purpose, as part of our nature. Notes Redux: Equality is not natural—nor desirable. Notes Thomas seems to be describing a kind of idealism of the Deepak Chopra, name-it-and-claim-it kind. 15 Origen seems not to have taken into consideration that, when we give a thing not as a due, but as a free gift, it is not contrary to justice if we give unequal things, without weighing the difference of merits, since payment is due to those who merit. Now God, as stated above, brought things into being, not as though it were due to them, but out of mere bounty. Therefore the diversity of creatures does not presuppose diversity of merits. Notes Redux redux: Equality is not natural—nor desirable. 16 Again, since the good of the whole is better than the good of each part, it does not befit the best maker to lessen the good of the whole in order to increase the good of some of the parts: thus a builder does not give to the foundation the goodness which he gives to the roof, lest he should make a crazy house. Therefore God the maker of all would not make the whole universe the best of its kind, if He made all the parts equal, because many degrees of goodness would be wanting to the universe, and thus it would be imperfect. in 3… should “casual” —> “causal”??? I don’t understand how “casual” (in the sense we use it nowadays) fits what’s being discussed. Both versions mistake the soul for a substance in itself. 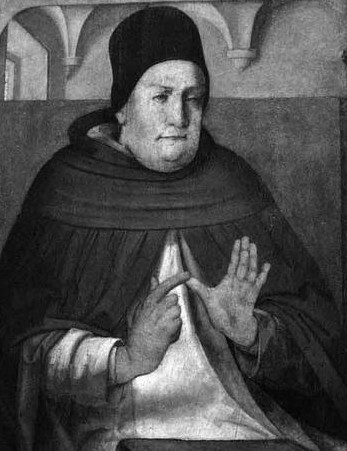 “My soul is not I.” — Thomas Aquinas. Or two soles being tread upon by the body they support. Might I suggest that the soul is the “thing” (I’ll roast in Hell for “reification” if nothing else) the purpose of which is to animate (give life to) a body and is the essence or “isness” of a corporeal being… which “contains” the individuality and universality of that being. As such the “isness” can exist without the body animated (a disembodied spirit) but it cannot do anything (or act) because its purpose is to animate a body. (I am speaking only of eternal, rational souls here… there are others). The incorporeal (metaphysical) mind is fed through the senses and acts through the bodily mechanics. Hence the necessity of a “General Resurrection”… a soul without a body can’t do anything and a body without a soul is a lifeless pile of chemicals. The soul is subsistent, at least in its intellective aspect, but it is not a substance in itself. A basketball is not two things: a mass of rubber and a sphere, and a human being is not two things: a mass of flesh and blood and a soul. Thanks YOS, I’ll chew on that. By the way, I am familiar with Catholic teaching that the soul and body are one. I’ll skip commenting on the demonic Social Darwinism lurking around as usual, but this is a real doozy: “Deny free will, deny the existence of the willer—and of the nature or essence of the willer.” How the #&!! do you come to that? Have you ever actually read or heard an argument against Free Will? Next Next post: Uncertainty (#1 New Release in Statistics) Book Page — Here Are The Details. Update!